Canvey Island exited the BBC Essex Senior Cup at the first hurdle on Tuesday night, going down 4-0 to a strong Braintree Town side at Cressing Road. Manager Mark Bentley made five changes from the side that were held to a 1-1 draw by Tilbury, bringing in George Allen, Alex Stephenson, Marlon Agyakwa, Martin Tuohy and Gabe Kellum. The hosts had announced the return of Hakan Hayrettin earlier in the day, with their former-manager returning in a caretaker capacity following the departure of Bradley Quinton on Sunday. 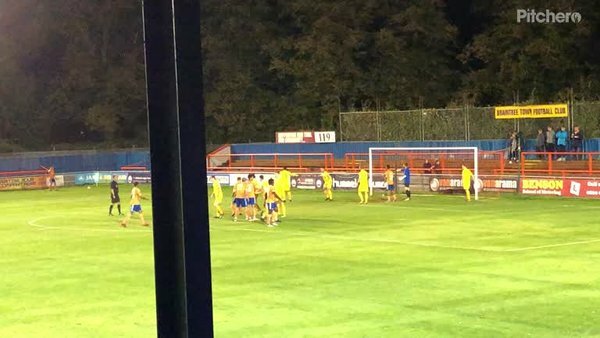 Hayrettin included ex-Canvey goalkeeper Ashlee Jones in his first starting XI, seven of whom started in their 2-1 National League defeat at home to Eastleigh at the weekend. The hosts opened the scoring after only seven minutes when they were awarded a corner on the left. Forward Reece Grant was left unmarked inside the area and duly headed home to score a simple goal. Grant was in again three minutes later when a flick on header released him in behind the Canvey defence. He managed to flick the ball past Harry Palmer, but when he came to shoot from the corner of the six-yard box he was denied by George Allen who had raced back towards his own goal. Canvey’s first chance of the evening came on 14 minutes when captain Sam Collins attempted a cross from the corner of the penalty area on the left. The ball hit a defender, but in doing so sat up perfectly for Collins to strike on the half volley, forcing an excellent fingertip save from Ashlee Jones to turn the ball over the bar for a corner. 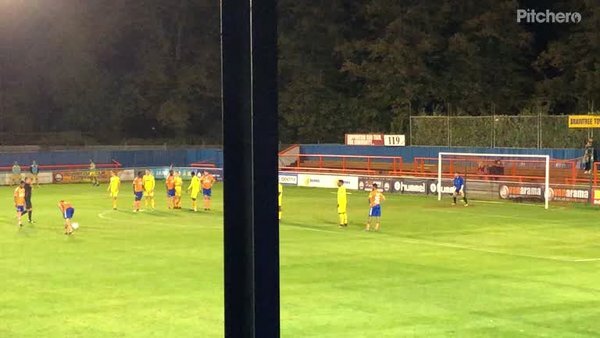 Braintree doubled their advantage when full back Jon Muleba delivered a defence-splitting cross from the right. Reece Grant missed with his attempted header but was fortunate that the ball hit his left foot followed by the back of the net. Gabe Kellum had a chance to open his account for the club on 26 minutes when he was played through down the left. Kellum burst into the box before neatly flicking the ball onto his right foot. 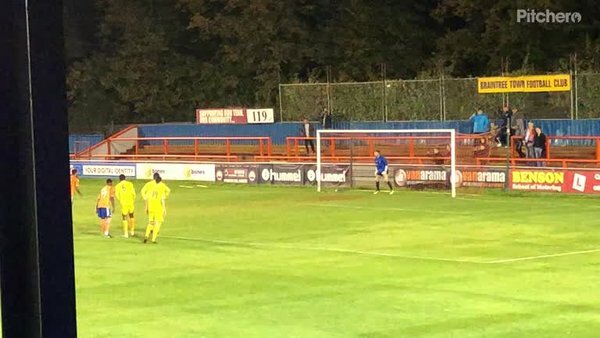 However, just as he was about to pull the trigger from six yards he was denied by a tremendous last-ditch sliding tackle from Joe Ellul to force a corner. It was 3-0 on 39 minutes when Sam Collins bundled over an opponent 25 yards from goal. Lyle Della-Verde stepped up and curled a superb left-footed effort over the wall and back down to beat Harry Palmer diving to his left. Things went from bad to worse on the stroke of half time when Alex Stephenson committed a foul inside the area to concede a penalty. On a hattrick, Reece Grant coolly rolled his spot kick straight down the middle to score. With the match as good as over at the break, Canvey nearly pulled one back in fortuitous circumstances on 64 minutes when Ashlee Jones miskicked a ball played back to him by a teammate due to a bobble. Martin Tuohy set off in chase of the loose ball, but he was unable to get to it before it rolled over the line for a corner. Other than this chances were a premium in the second half, with Braintree not overly exerting themselves in search of further goals and Canvey unable to find a way through the Iron defence despite some more encouraging football. The closest they came was in the dying moments when Sam Collins struck one of his trademark free kicks from a long way out which Ashlee Jones saved but couldn’t hold. However, the keeper was able to pounce on the loose ball before Martin Tuohy could tuck home the rebound.